To serve our members by enhancing their knowledge of public relations and providing access to professional development opportunities. To serve the public relations profession by helping to develop highly qualified, well-prepared professionals. Membership is due October 30, 2017. Please join us on OrgSync and meet with us in person prior to this date to complete your membership. Financial Assistance is available. To be involved in the planning of this event please email us. In 1968, the Public Relations Society of America (PRSA) founded the Public Relations Student Society of America with the declared purpose of cultivating a favorable and mutually advantageous relationship between students and professional public relations practitioners. Today The Public Relations Student Society of America has more than 8,500 members in 270 chapters on college campuses across the country. Visit the PRSSA national website. Congratulations to Jacob Poore, the Coyote Advertising team, and the Fall 2016 COMM 243D students who are being recognized at the 2017 Public Relations Society of America, Inland Empire Polaris Awards in the student PR campaign category for their planning and execution of the 2016 Holiday PSA Food Drive benefiting The DEN. The Polaris Awards are an annual program that recognizes the very best in strategic public relations programs and tactical execution in the Inland Empire. PRSSA Chapter President, Andrea Stewart, is being recognized at the 2017 Public Relations Society of America, Inland Empire Polaris Awards in the student PR campaign category. Stewart submitted "So Cal Yard Handbook Proposal" that was created for Western Municipal Water District while enrolled in COMM 341: Introduction to Public Relations during Spring 2017. Students who are currently working on any public relations projects at CSUSB are encouraged to submit their student projects for 2018 Polaris Awards after June 2018. PRSSA Chapter President Andrea Stewart and Vice President Fatima Rivera-Ortiz are attending the Public Relations Student Society of America National Conference, the largest gathering of public relations students in the country. The national conference, this year, themed “The Revolution Continues,” gives our participating students the opportunity to network and to explore different sections of the public relations industry. PRSSA cultivates a favorable and mutually advantageous relationship between students and professional public relations practitioners. What does the PRSSA club do? PRSSA holds monthly meetings exploring various topics in PR, and also participates in national PR competitions for prize money and scolarships. 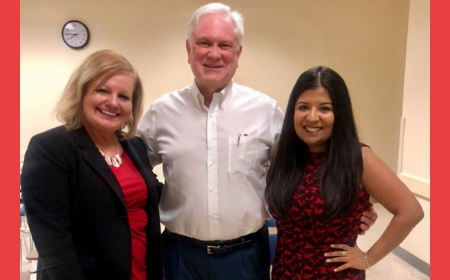 Read More about First PRSSA Meeting of 2019 a Success!